This resource is available in pdf. What is the teach-back technique? 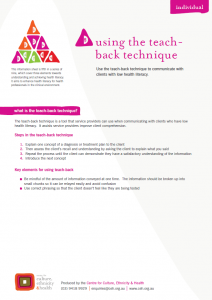 The teach-back technique is a tool that service providers can use when communicating with clients who have low health literacy. It assists service providers improve client comprehension. 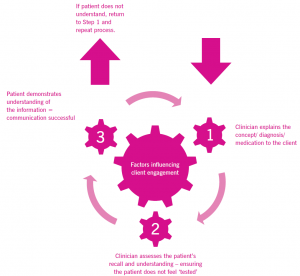 A GP is finishing her consultation with a patient and is adjusting the patient’s medication. She uses the phrase ‘I want to be sure that I explained your medication correctly. Can you tell me how you are going to take this medicine?’ She emphasises that she is merely asking in order to do her job correctly.